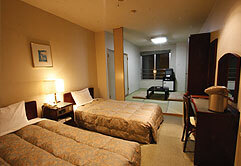 Hotel De Laile Hakuba is a smaller hotel located on the slopes of Happo One, the hotel comprises of only 35 rooms. The property itself is a very clean, comfortable and charming hotel and is assigned the 3 star level of hospitality rating. 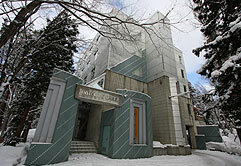 Its best feature is its ski-in ski out location, only a 2-minute ski or walk to the ticket office. Natural indoor and outdoor mineral hot-springs are a plus, just perfect after a strenuous day on the slopes. The hotel’s restaurant serves western and Japanese cuisine and has nice mountain views. This property works very well for groups and individuals alike, the service levels are excellent and the natural beauty of the area in which it is located comes alive at night with the romanticism of an enchanted forest on its doorsteps.